Dr Glenda Caldwell recently presented a paper at the University of Sydney’s Annual Design Research Conference. The paper was co written by Dr Muge Belek Fialho Teixeira, Dr Jared Donovan, Dr Glenda Caldwell and Kirsty Volz. Below is an excerpt from the paper that was presented. Art fabricators, sometimes called artist technicians, have had an increasingly substantial role in the production of artworks, pavilions, and bespoke street furniture. The uptake of commissioning art fabricators is due to a few, identifiable factors. One is a remarkably prosperous art market, especially in the last decade. The other is the “post-skill era,” which has meant the employment of a fabricator has become the acceptable norm and commonplace in the production of art.” Additionally, the changing scale of public art due to neo-liberal planning policies that have shifted the commissioning of public art to the private sector; where it appears, bigger is better. The scale of these projects is only made possible by fabricators such as UAP. As such, their impact on the art, design and architecture world has been to fabricate what was previously unachievable. This expansion of scope in public art sculptures is changing the nature of creative production, from one solely possessed by single artists. It is, therefore, a reflexive position between artist and fabricator, where big art cannot exist without the other; the scale of contemporary public art sculptures is reliant on the supported, collaborated existence of both. The current discussion about the role of art fabricators is concerned with whether artists should credit them, but this all depends on how you define art. Is it the idea or the physical outcome? This topic is not the basis for this paper. Instead, it focuses on how the craft, making, and fabrication processes are a form of research and can contribute to research on innovations in construction and fabrication approaches. Other than Patsy Craig’s documentation of Mike Smith’s art fabrication studio in London, published in the book Making Art Work (2003), little has been written about these studios that produce large scale public art, building facades, and pavilions. Craig describes Smith’s making as a process of ‘endeavour and enquiry.’ This paper aims to further Craig’s research through the work of UAP Company. Additionally, a study of these processes outlines how these fabricators are helping achieve bigger, more complex sculptures and structures, and how these innovations in fabrication might influence the construction of the built environment, more broadly. UAP provides a case study from which to investigate the physical, social, cultural and economic impacts of innovations in fabrication processes. Their experimentations in fabricating processes are achieved in an environment where meeting deadlines, achieving commercial imperatives are also integral to their work. In this paper, we examine UAP’s work in the context of broader social, cultural and economic influences. This survey highlights that advances in architectural fabrication do not occur in isolation, but are informed by government investment, significant cultural events, and cultural policy. We found in this research that UAP often borrows know-how, technologies and tools from different disciplines and manufacturing processes as well as informing new fabrication processes. Having all these motivations in hand, this paper focuses on UAP and its milestone projects. Example projects from UAP are used to describe the development of their approach to fabrication, in its current state and their position on future processes. The discussion of UAP’s work in this paper demonstrates the role of design-led manufacturing and that the creative industries are capable of driving change in advanced manufacturing and digital fabrication. 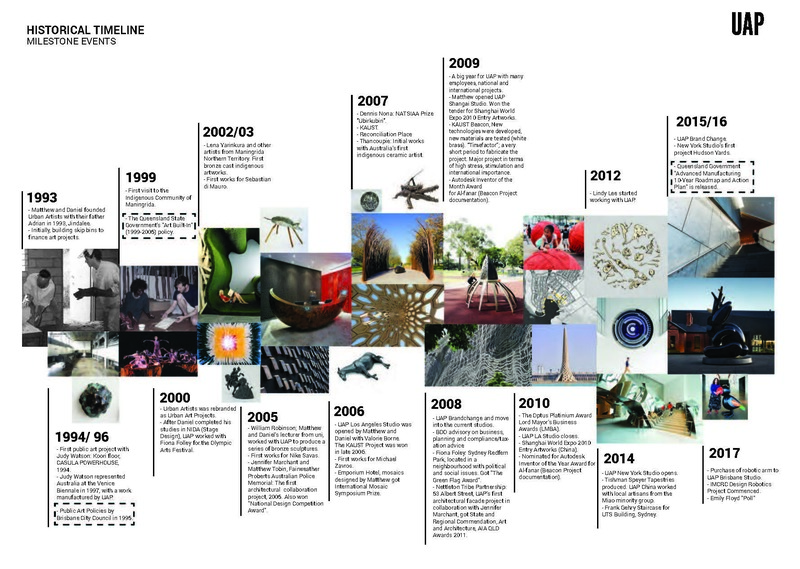 These projects represent specific milestones for UAP, beginning with their partnership with Lena Yarinkura on the Seven Dogs Project in Brisbane (2003 and 2010), then the King Abdullah University of Technology’s (KAUST) Art Project in Saudi Arabia (2009), and lastly the Gehry staircase at the University of Technology Sydney (2015). Investigation of these projects reveals transgressions between making, craft and technology as key instigators of UAP’s evolution and innovation. Moving from the mass produced to a mass customised, from a local to a global world, companies like UAP must continually find ways to cope with change and look toward the future to be competitive. Lena Yarinkura is a is a Kune-Rembarrnga woman. She is an artist working from the Maningrida Community in Arnhem Land in Northern Australia. Yarinkura initially collaborated with UAP, through an introduction from the Waanyi artist, Judy Watson in 1999. UAP presented metal-casting processes as part of a workshop held at the Maningrida Arts and Culture Centre. From this workshop, a long term relationship between Lena Yarinkura and UAP commenced. In a reciprocal exchange between artist and fabricator, Yarinkura worked with cast metal for the first time, and UAP developed new casting methods by working with the forms and surfaces created by Yarinkura’s woven sculptures. Initially, bronze cast sculptures such as the Camp Dog 2 were produced in 2003 (Figure 2). UAP’s partnership with Yarinkura continued, resulting in a major urban art project scheme, Seven Dogs, at Brisbane Airport’s Skygate, in 2010. The design process of the metal cast objects started with hand-woven designs Yarinkura created. These were then sculpted in a material that can be sand moulded, such as polystyrene foam. The sand moulds were used to form the metal sculptures by pouring hot liquid metals such as bronze or aluminium into them. The metal casts were then taken out of the moulds once they cooled down. This exchange of craft process and metal casting is an example of the research, by knowledge exchange, which informs and can be an indirect outcome from the fabrication of public art. The second project to be discussed is the KAUST Art Project, located in Saudi Arabia. This project was a commission won through UAP’s Los Angeles Studio in 2006. Won via an international tender, HOK was chosen in collaboration with UAP to produce artwork commissions that celebrate KAUST as a global university. The primary focus of the project was to interpret and present interdisciplinary art and design that stimulates creativity and interaction. Therefore, UAP invited artists from all over the world to take part in this art project, such as Carsten Höller, Oliver van den Berg, Sopheap Pich, Iñigo Manglano-Ovalle, Subodh Kerkar, Donna Marcus, Dalziel & Scullion, Dennis Nona, Richard Deacon, Erwin Redl, Fiona Foley, Simeon Nelson, Nja Madhaoui, David Trubridge, and Jason Bruge. Each artist worked with an interdisciplinary team to provide a site-specific artwork for various locations in the KAUST site. The scope of this project and the constrained construction timeline of only 30 months required UAP to develop innovative, efficient fabrication processes to meet their deadline. They also developed new ways of managing work in the Brisbane workshop and on-site; as KAUST had several artworks to be constructed at the same time. The explorations during the KAUST project resulted in experimentations with new materials such as white brass, and the use of new technologies both in the workshop and the design documentation departments of UAP. This required them to engage with new software to help streamline documentation processes, and given the manufacturing complexities of some of the produced artwork, UAP was awarded the Autodesk Inventor prize in July 2009 for their effort in documenting some of the artworks. One of the major artworks of the project was the Al-Fanar/ Beacon designed by Daniel Tobin. It is a sixty metre high structure that is a contemporary interpretation of a light house (Figure 4). 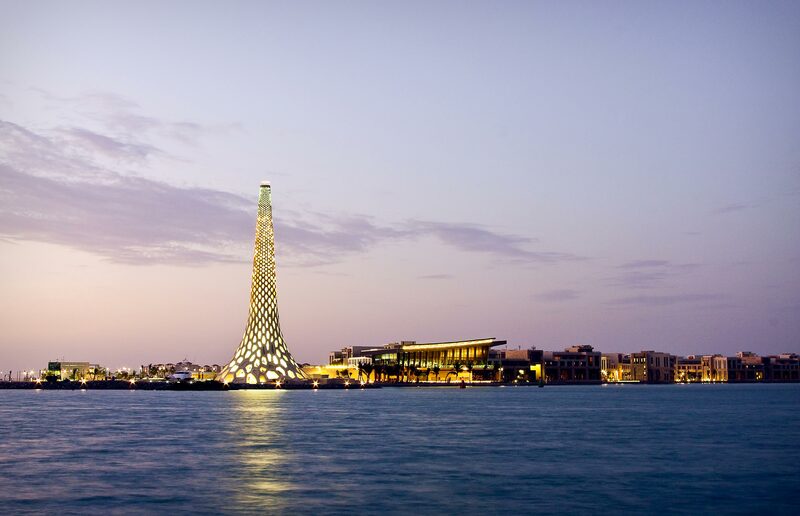 It has become the symbol of KAUST, defining the entry point to the harbour where the university is situated. Inspired by the marine life of the Red Sea, Al Fanar is constructed from Ancient Arabic Maritime traditions, in-region artworks and architectural detailing. Its highly complex structure is built from pre-cast concrete blocks that are in amorphous hexagonal sections. The interior space provides a gathering space with a play of light and shadows. It is also an example of a large scale sculptural and architectural work designed and fabricated by UAP. The third project discussed is the Gehry Staircase. Designed by Frank Gehry, the Dr Chau Chak Wing Building at UTS Sydney has a sculptural central staircase that works as a bridge bringing students together. UAP was commissioned to fabricate these stairs (Figure 5). Working with Gehry Partners, UAP explored fabrication methods for the sculptural staircase that required complex research and investigation into form, material, and structure to determine how best to construct this ambitious vision. The sculptural piece is built from hand beaten stainless steel metal plates that are welded together and then polished to achieve the smooth mirrored effect. As with many of Gehry’s designs, the staircase was designed manually through an iterative process of cyclical testing. It was then digitally modelled for precision, representation, and manufacturing. However, due to the limitations of manufacturing processes especially in steel, it was difficult to achieve the complex forms of the staircase design by automatic manufacturing systems. The complex form of the staircase challenged UAP’s existing capabilities. The manufacturing of the staircase involved dividing it into modular pieces which were built one by one by metal casting artisans, welders and polishers. The modular pieces were then assembled in the factory using a mock-up model; then they were placed on site. Transgressing a digitally modelled staircase by manually making it was a painstaking process, leading UAP to explore advanced manufacturing possibilities for the manufacture of future projects. As part of this strategy, and in response to an increasing demand of complex architectural designs, UAP has acquired an industrial robotic arm. To further develop its capabilities and examine the affordances of robotic vision systems, UAP is currently undertaking a research project funded by the Innovative Manufacturing Cooperative Research Centre (IMCRC), in collaboration with QUT and RMIT. The project is looking into research-led innovation to enable mass-customisation manufacturing of products, processes, and services for art and architectural fabrication in Australia. As the creative industries continue to flourish, influenced by neo-liberal planning and policies, the role of the art fabricator continues to grow in both scope and significance. While neo-liberal approaches to planning policy transferred investment in public art from the public to the private sector, its intention was as Michael Keniger wrote, to emphasise that building is ‘a cultural act as much as it is a physical one.’ Stuart Cunningham describes this economic shift where ‘creative production and cultural consumption are an integral part of the new economy.’ The role of the art fabricator is too often diminished by an emphasis on a sole author, perpetuated by a post-conceptual art world, that has yet to let go of 20th century practices in the creation of art. This paper has aimed to highlight the important contribution art fabrication has to make as a process that is informed by, and informs, research and innovation. Through the analysis of UAP’s timeline, this paper presents two important findings. Firstly, that over time public art has progressed from an autonomous form applied to public architectural spaces, to architectural objects or sculptures that are seamlessly integrated into a project. This is exemplified through works such as Yarinkura Seven Dogs for Skygate (2010), Brisbane and Frank Gehry’s stairs (2015) in the UTS Dr Chau Chak Wing Building. Secondly, the complexity and scale of art works have compelled UAP to embrace innovations in fabrication technologies through works such as KAUST (King Abdullah University of Science and Technology). UAP’s engagement with collaborative processes has come about from a reciprocal engagement between artist and maker. Artists’ and architects’ vision are pushing UAP to engage in experimental and cutting edge processes and technologies, while UAP has shared their processes and capabilities to push artists’ and architects’ material use and knowledge. This exchange of knowledge between visionary and maker demonstrates a clear transgression between craft, making, and technology. By documenting art fabrication processes, and analysing them further, there is the potential that the research and innovation by making, could be shared more broadly with construction and manufacturing industries involved with the built environment.